Hong Kong International Airport, also known by its proper name Chek Lap Kok, is an absolute star of an airport. Prior to its opening in 1998, travelers flying into Hong Kong experienced a suspenseful landing courtesy of high-rise condominiums set so close to the old Kai Tak Airport, passengers could see right into the living rooms as the plane made its approach! Given Kai Tak Airport’s insurmountable problems, the Hong Kong government decided to build a new airport literally from scratch. A 300-foot-high island north of Hong Kong was scraped down to 22 feet above sea level and expanded to over four times the original area, eating up two neighboring islands in the process. Today, over 40 million passengers go through Chek Lap Kok annually – and despite its size and passenger volume, the place feels incredibly well-run. The Sir Norman Foster-designed terminal building maximizes ease of use despite its massive size. The soaring, scalloped roof; legible routes; and visible sea and aprons outside allow visitors to orient themselves effortlessly. 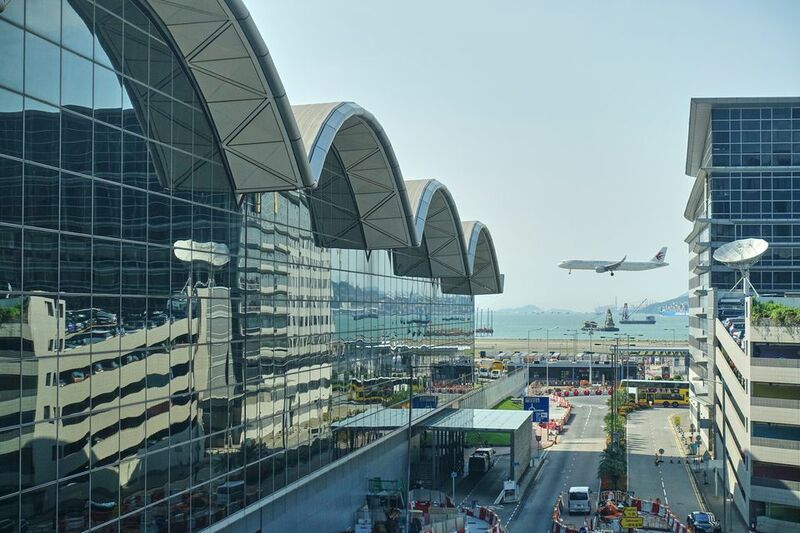 Skytrax named Chek Lap Kok the world’s best airport eight years running, and each year it’s regularly neck and neck with nearby neighbor Singapore Changi Airport. Hong Kong Airport consists of two terminals, with Terminal One being the second biggest terminal building in the world. At Terminal One, departures are located on the upper level and arrivals are one the lower. At Terminal One, Immigration is polite and brief – you should expect to wait between 5 and 15 minutes to clear entry formalities. Baggage can be found after immigration and is usually on the carousel within 10 to 15 minutes. Terminal 1 has two arrival gates and if someone is picking up you, you should agree to meet at either Gate A or Gate B. Transport between Terminal 1 and 2 is provided by a free Automated People Mover, which travels roughly every two minutes. Thanks to a rail and road link between Hong Kong and the airport, transportation in and out of Chek Lap Kok is a breeze. Transport to and From the Airport. The best way to reach the city is via the Airport Express, although there are also many bus services and of course taxis. You can find out more in our Hong Kong Airport Transport guide. Travel onto China. It is possible to take bonded ferries to Shenzhen, without ever having to clear Hong Kong immigration. This applies for both departing and arriving passengers. There are also several coach companies offering services to major cities all over China. There are also travel agents at the airport that can assist you with obtaining a Chinese visa, although this cannot be done on the spot. In-Town Check-In. In conjunction with the Airport Express train service, the airport offers check-in at Hong Kong station, up to one day in advance of your flight, including baggage on selected airlines. Check out our In-Town Check-In article for information on which airlines provide the service and how to use it. There is free WiFi available throughout Terminals One and Two. Left luggage facilities are available in the arrivals hall of Terminal One and on Level 3 of Terminal Two. There are also three Tourist Information booths in the arrivals hall of Terminal One, where you can pick up a map and get essential information about the city. There are several ATMS and money exchange counters. Hotels at Hong Kong Airport. Hong Kong Airport has two dedicated hotels, the luxurious Skycity Mariott and the massive Regal Airport Hotel, which both come loaded with amenities and facilities. Only slightly less impressive, but thankfully massively cheaper, the Novotel offers sleeps for those who aren't on expense accounts. Check out Hong Kong Airport Hotels for full reviews of all three. Dining. Airport dining is as good as fine dining at Chek Lap Kok, with several upmarket eateries, as well as a sprinkling of more budget-minded options. There is also Hong Kong's only Popeye Chicken and one of only two Burger Kings in the city to choose from. You can check out a floor plan, where you'll find the location of these restaurants and many others in the airport. Hong Kong International Airport official page – Dining. Shopping. The Airport Skymart ranks as one of the best shopping malls in Hong Kong and if you enjoy hitting the shops it might be worth setting aside some dedicated time to explore the mall. The Skymart also has a downtown pricing guarantee, which means stores at the airport cannot inflate their prices! Airport shops can be found both before and after the security check. Burberry, Bvlgari, Chanel, Gucci, Prada, Ralph Lauren are some of the blockbuster names to be found in the mall. Hong Kong International Airport official page – Shopping.